The National Code of Practice for Automotive Recyclers was developed by the Automotive Recyclers of Canada (ARC) in 2008 for recyclers participating in the National Vehicle Recycling Program called “Retire Your Ride” in order to standardize the process for recycling end-of-life vehicles (ELV’s) and to protect our water, air and soil from the harmful materials they contain. Given the popularity and success of the code, ARAAC decided to not only continue with the program, but to expand its scope after the Retire Your Ride program ended in March 2011. The Code of Practice was renamed the Canadian Auto Recyclers’ Environmental Code (CAREC) and expanded to cover all end-of-life vehicles (not just those targeted by the Retire Your Ride program). and regulations, as well as with product and industry stewardship programs, where applicable. 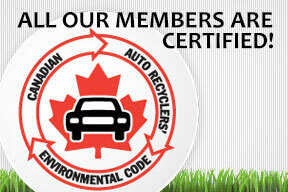 ARAAC has made it a policy that any new or existing member must be audited by an independent third party and certified to meet the standards of the the Canadian Auto Recyclers’ Environmental Code. NEW in 2016 – Members have agreed to publish their CAREC scores so the public is aware of their commitment to ever-improving environmental performance.